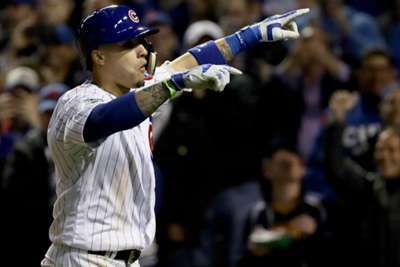 Javier Baez made yet another case for National League (NL) MVP while leading the Chicago Cubs to a 4-3 10-inning victory over the Washington Nationals on Thursday. Baez collected three hits, and played a part in all four of Chicago's runs. He doubled in Kris Bryant in the fourth inning, later scoring himself. Then, in the sixth, he bashed his 31st home run of the season. But Baez's most dramatic contribution occurred in the 10th inning. Deadlocked at three runs apiece after nine innings, Baez came up to bat in the top of the 10th and laid down a perfect bunt, which again scored Bryant. Baez reached base four times in this game, drove in three and scored two. Including his defensive prowess and the fact he has led the Cubs' lineup which has dealt with multiple injuries this season, he is a prime candidate to win MVP. The win moved Chicago 1.5 games ahead of the Milwaukee Brewers in NL Central, but they lost closer Pedro Strop to a hamstring injury for at least two weeks, according to Joe Maddon. The St Louis Cardinals are 4.5 games back. Rockies sluggers Trevor Story and Nolan Arenado both clobbered home runs in a 10-3 win over the Diamondbacks. Both players finished the game with two hits, as Arenado hit his 34th home run and Story bashed his 33rd. Arizona are now 4.5 games behind the Rockies in the NL West. The Dodgers also won Thursday, remaining 1.5 games back of Colorado. Nolan is now the youngest third baseman to have four-straight seasons of 30 HRs and 100 RBI! Athletics starting pitcher Brett Anderson allowed four earned runs off seven hits in a 5-3 loss to the lowly Orioles. Oakland are trying to catch the Astros for the top spot in the American League (AL) West, and the Yankees for home-field advantage in the wildcard game, so losses like this cannot happen. The A's are now 3.5 games back of the Astros for the lead in the West and 1.5 games back of the Yankees in the wildcard. There is something about Cardinals pitchers leaving the yard. St Louis fell to the Dodgers 9-7. Arizona are desperately trying to remain in the postseason picture, and they will send Robbie Ray (5-2, 4.18 ERA) to the mound to try and steal a tough road win. The Astros will counter with Dallas Keuchel (11-10, 3.59 ERA), as they try to hold off the Athletics in the American League West. 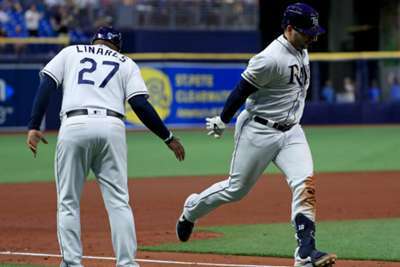 A win over the Kansas City Royals saw the Tampa Bay Rays snap a four-game losing streak in MLB.